The colour of these panels are called dark brown. At the centre of each panel sits the bud of the lotus flower , which are a sign of purity and prosperity in the Buddhist sense. Our wall panels are hand carved by highly skilled artisans in Thailand who spend countless hours meticulously carving these wonders of wood craftsmen. Most panels are made in sections for easy transport and to make hanging more manageable. Because each piece is a unique creation, some variations may occur. Size = 6'X6'Feet These panels make beautiful bed headboards - both hanging or freestanding - or as decorative panels. Then, he will assemble this product side by side. The weight of this package is 30 kiograms. Great idea to be a nice gift. Please look at a category "Wall Hanging". 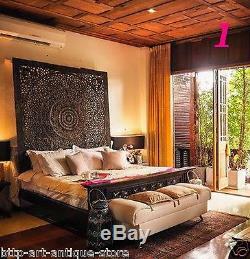 You will see many Teak Wooden Wall Art Panels at the reasonable price. Our packages are never lost. Please contact me with photos if you found a problem such as wrong item or broken item within 7 days after you got a parcel. We will give you a solution case by case. If the item becomes defective more than 7 days after the date when you signed your signature, we will give you an advice to repair panels. Panels were fallen from the wall and broken. However, we will give you an advice to repair them. Good Luck and Thanks for Visiting. 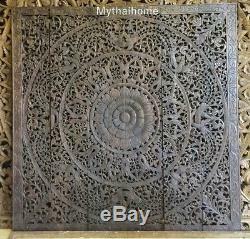 The item "6ft 72 King Bed Mandala Headboard Teak Wood Carved Panel Large Wall Decor Lotus" is in sale since Saturday, February 24, 2018.